My last day in La Paz was rushed. I wanted to do some last minute shopping and then ship a package home before catching a night bus to Sucre, Bolivia. Everything in South America is SLOW, so of course I got held up at the post office which was unnerving since I was already pressed for time. In the end, it cost me $45 to send 5 kg worth of Bolivian goodies and I made it to the bus station with 5 minutes to spare. Funny enough, everything is on South American time, so our bus was 45 minutes delayed. I guess there was no need to rush after all. The 12 hour ride to Bolivia’s capital was freezing, but once we got to Sucre, the sun was shining. Sucre is rather pretty – white washed colonial buildings and parks. During the first day, I walked to the central market and bought fresh fruit and veggies to make stir fry…. all for under $3. There are also these great fresh fruit juice stands where you can drink two big glasses of fruity goodness for under $1. I had strawberry-kiwi! The women use bottled water as well to keep gastro problems at bay. 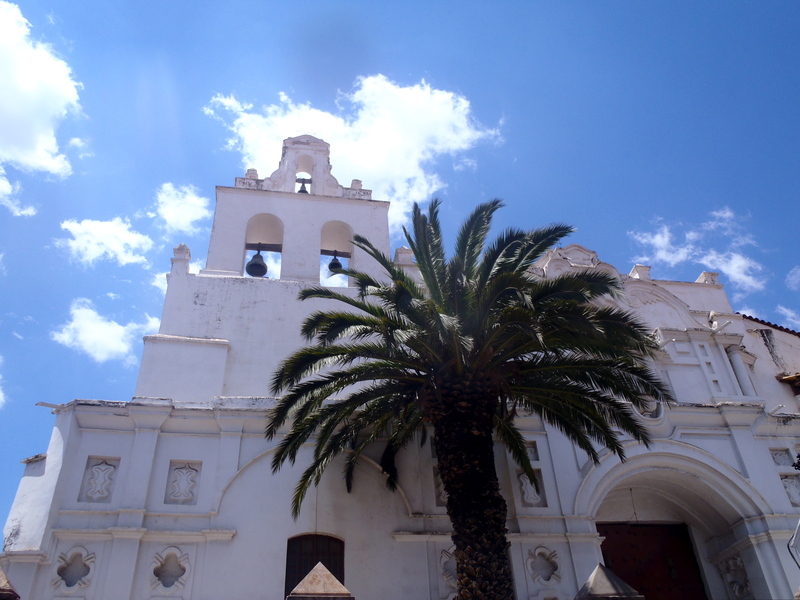 Later, I cruised the streets of Sucre looking for a tour in the surrounding area to do. 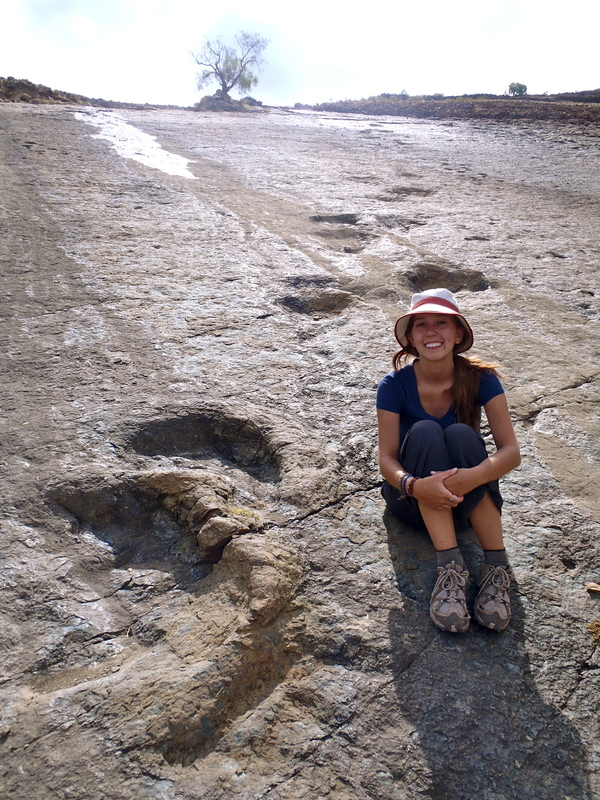 I was really interested in seeing the 20,000 year old rock paintings as well as the dinosaur tracks. Each pit stop involved some hefty hiking – so Stefanie and I chose a the 3 day hike. The hike was tough. Most of the ‘trail’ was rocky and hard to trek. My ankles suffered quite a bit. The first day we saw the rock paintings, which were amazing! 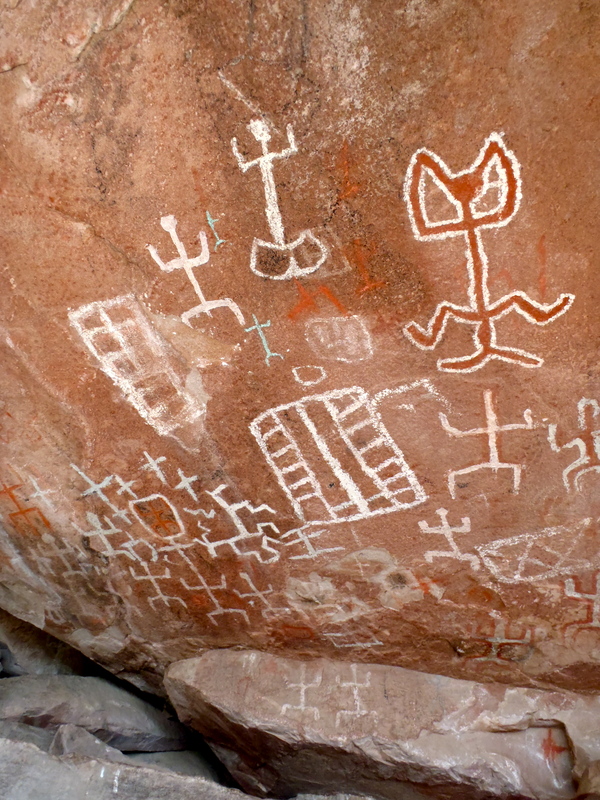 They looked very tribal – monkeys, swirls, stick figures, etc. One set of paintings were in a cave and the others were on a low angled rock wall. After spending a bit of time there, we hiked another 3 hours to our family stay, ate and crashed. The second day was the most challenging. 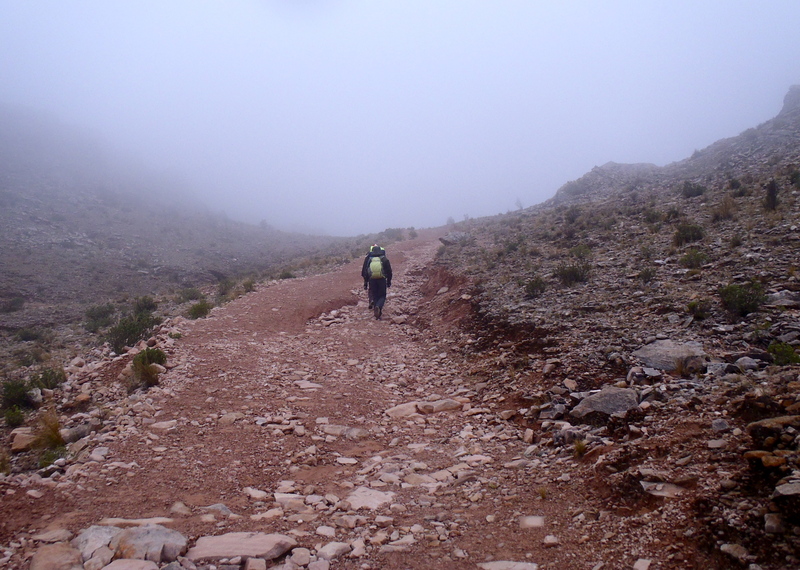 We hiked through so many different terrains – sand, rock, grass, dirt and we even crossed a river. We were suppose to hike 7-8 hours, but our guide asked if we wanted to hike the last 3 hours the same day, instead of waking up early on the third day to finish. Apparently, the road from the villages into Sucre is closed during the afternoon, so there is only one bus to catch in the morning and if you miss it, you have to spend an extra day. We didn’t want to wake up at 5:30am, nor did we want to miss the bus, so we agreed and pushed forward… BIG MISTAKE. Once we finally reached the village of Potolo, everything was closed, so we ended up staying at this dirty local guesthouse. Stefanie and I had to share a twin bed, the other woman had the other twin bed and our guide slept on the floor. I was so exhausted from the day and my legs ached. It was worse than the Inca trail! The guesthouse family cooked dinner for us and then we went right to sleep. I woke up in the middle of the night extremely sick! Vomiting, diarrhea, the works. It was awful, not only because they didn’t have a proper toilet, but I had no clean water to drink! I couldn’t even rinse my mouth. In the morning, I was sick again, but we had to catch the 3 hour local bus back to Sucre. It smelt so bad and was so cramped… not ideal for a person who spent the night throwing up. Thankfully, I made it through the whole journey, but once I arrived at the hostel, I ran to the bathroom and it started all over again. I was planning on leaving for Potosi that afternoon, but I ended up booking another night in Sucre and spent the whole day in bed. I was weak, but at least I wasn’t throwing up. The next morning, I felt much better, especially after showering and brushing my teeth. We took the bus to Potosi and everything was okay. I was still very crampy, but no other symptoms until after I fell asleep. Once again, I spent the entire night running to the bathroom. This time, it was worse! 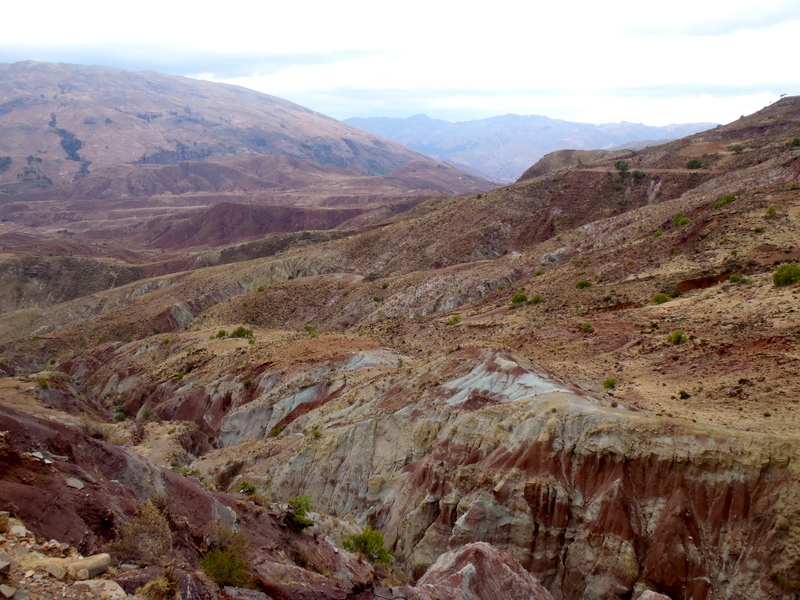 It was awful because this morning we planned to go on a working cooperative mine tour in Potosi. Obviously, I couldn’t go but Stefanie went without me and I spent the entire morning in bed severely medicated! I feel a bit better now, thanks to Gravol and antibiotics. We are scheduled to take a bus to Uyuni tonight where we will begin our Salt Flat tour – something I have been looking forward to this entire trip. I hope it’s the end of my sickness. Nothing is worse than getting sick on the road, when you want nothing more than to be in your own bed and have your own comforts. Wish me good health everyone! I need it! ← La Paz, Bolivia & the Amazon!